The leafy districts and maritime history of Greenwich are a draw for tenants and tourists alike. Rentify can help you make the most of your letting with our handy borough guide. At Rentify we have property specialists dedicated to Greenwich, armed with local expertise and unmatched valuation knowledge to find you the right tenants. The Royal Borough of Greenwich, as it has been known since 2012, is world famous for being the location of the Prime Meridian. It has a long-standing maritime heritage attracting tourists to famous sites such as the Cutty Sark and the Royal Naval College. Leafy districts like Greenwich and Charlton attract families, while regeneration projects in Woolwich and Deptford are pulling in a younger crowd priced out of central London. Though Greenwich is only served by one tube station on the Jubilee line, it benefits from plenty of DLR stations and several mainline rail services. Crossrail services will also call at Woolwich and Abbey Wood from 2018. Around 61% of housing stock in Greenwich is flats, with the rest made up of semi-detached, detached and terraced housing. Leafier districts are home to plenty of period style homes, whereas more urban areas are a mix of local authority blocks and new build apartments. Greenwich's many districts each have their own character, catering to a variety of residents. Here's our top picks for new landlords in the area. 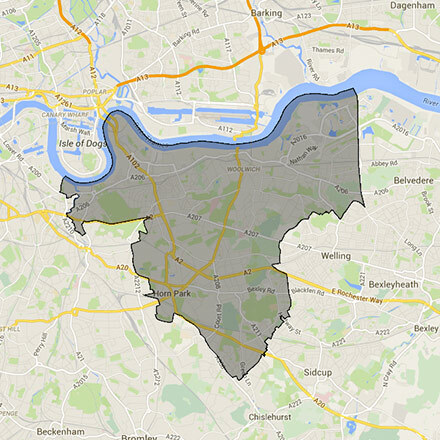 This borough covers the BR7, DA15, DA16, SE10, SE12, SE13, SE18, SE2, SE28, SE3, SE7, SE8 and SE9 postcodes. Rentify uses proprietary methodology for data collection and processing. Borough data is collected from Rentify's property database and external public sources.